Firefighter Stephen Siller’s heroism is celebrated every September during the annual NYC Stephen Siller Tunnel to Towers Run in which Stephen’s footsteps are retraced from the Brooklyn Tunnel to Ground Zero. Siller was one of the first to arrive at the Twin Towers on September 11, running on foot with sixty pounds of gear strapped to his back, as the Brooklyn Battery Tunnel was closed. Proceeds from the Run go to the Stephen Siller Foundation which raises money for children who have lost one or both parents, and for firefighter burn victims. This year, the 9th annual NYC run will take place on September 25, 2011. Additionally, for the first time, nearly 50 Tunnel to Towers Runs will take place throughout the country on 9/11, providing communities a similar opportunity to commemorate the day. American Express lost 11 employees on 9/11. Visitors to downtown Manhattan are invited to see a memorial art piece called “11 Tears” located in the lobby of American Express's corporate headquarters in the World Financial Center. 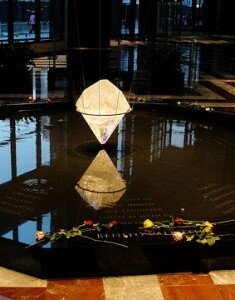 The 11-sided granite piece, created by architect Ken Smith, memorializes the 11 employees with tears falling from the ceiling into each triangle. Thousands of people will form a human chain along the waterfront from the tip of Lower Manhattan heading north in this event sponsored by Manhattan Community Board 1. There will also be a Wall of Remembrance in Battery Park where you can post a message or memento; a portion of this wall will be displayed by the 9/11 Memorial Museum. Pre-registration is required: http://www.handinhand911.org/. The long-awaited memorial opens this Sunday. Reservations for entry are on a timed basis and must be made at http://www.911memorial.org/visitor-passes. A donation is suggested but not required. Designed by Daniel Libeskind, the memorial is slated for completion in 2014 and is currently surrounded by construction. Bring proper identification and leave any large bags at home. No facilities are available. In these galleries at 120 Liberty Street, adjacent to the 9/11 Memorial site and near the new Freedom Tower, memories and photos of members of the World Trade Center community recount the tragedy and the response of people from around the world. Tours can be arranged and a $10 admission charge goes towards educational programming and the operation of the Center. The Visitor Center is a project of the September 11th Families’ Association. The Pace community comes together to remember the students and alumni lost. This debut performance is an exploration of the “Post-9/11” generation and aftermath of the September 11th attacks written by 13 young people between the ages of 9 and 21. This entry was posted on Tuesday, September 6th, 2011 at 11:11 pm	and is filed under Stuff to Do. You can follow any responses to this entry through the RSS 2.0 feed. You can leave a response, or trackback from your own site.